Instagram Stories’ analytics are important for business owners and marketers alike as it can help show you what your audience is connecting to and engaging with. To be fair, Snapchat does give you data on how many people viewed a snap as well as who viewed it; however, after 24 hours that data is gone. Instagram keeps how many people viewed a story and more for 14 days, allowing you to gather more data from your followers. You can filter your stories for the past 14 days by impressions, reach, exits, and replies. If you want to filter the results even more, you can apply an additional filter for the last 24 hours, 7 days, or 14 days. The ability to see when viewers exit is huge! This can help you determine if your daily stories are too long or even what type of content your viewers don’t appreciate. Instagram does currently lack the ability the sort this data. Instagram Stories have the ability to mention other accounts (clicking the username brings up a bubble with the username that will take you straight to their profile page) or even your own. In doing so, stories is an excellent way to appear at the top of your followers’ feeds, showcasing your latest posts, and directing them straight back to your business’ content. Snapchat has yet to add any sort of tagging feature. There also is no core profile feature to direct users to in order to learn more about your products or services; stories is the snapchat product. Boomerang was originally a separate app by Instagram that allowed users to record a short 3-second long clip that would repeat itself forward and backwards. It has since been baked into the flagship Instagram app. The effect has become immensely popular on the platform, particularly with millennials. The effect is very reminiscent of GIFS, which are wildly popular with millennials on Tumblr and have even recently caught the eye of Facebook. 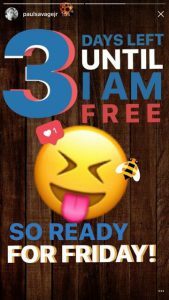 With about 90% of Instagram’s user base under 35, it is an excellent platform to capitalize on that demographic. The popular effect is a great way for brands to get creative and produce native content as well! Instagram is a creative community, made up vastly of designers and creators. The tools made available to users reflects this demographic with a large amount of options and customizations. One of the biggest perks is the ability to change text size. No more awkward, hanging words that take up a ton of space. Instagram also gives you the ability to add multiple text layers which has yielded some original text designs for posts. Users have used multiple text layers to create shadows and other effects, for example. Simple, modern “stickers” allow users to showcase weather conditions, the time, or their location. There are also stickers for the days of the week and holidays; Instagram is constantly updating the collection to choose from. They also have multiple pen tools that allow you to draw or write in different styles. There is a thin marker style, a thicker, highlighter line with a slight opacity, as well as a line with a neon, outer glow. The ability to use all of these styles with any color you can imagine rounds out the customization options in Instagram. Instagram’s stellar filter options not only make posting fun but they also can make your photos look stunning! With filters that add gradient, color overlays, or increase brightness, or decrease noise, the filters are specifically designed to make photos or videos look great. They provide the finishing, professional touch, giving you the same freedom to edit your photos or videos as you would in the main app. 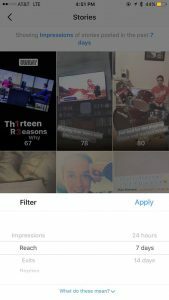 While snapchat’s main focus has been on geofilters and the use of facial recognition to overlay graphics onto your face or videos, Instagram focuses on the creative process of posting: choosing a subject and unique angle and then selecting one of Instagram’s several filters to polish your media before posting. Instagram Stories is ramping up it competitive offerings against snapchat by launching their own geofilters. While currently only available in select cities, the feature is sure to roll out more broadly very soon.